Composite decking has become a very popular choice to many homeowners and business owners these days. As a matter of fact, dozens upon dozens of companies are now into making composite decks. These decking choices come in a variety of colours and are often made out of either polyvinylchloride or polyethylene. Some combine fibres from a wood species with that of recycled plastic. If you are interested to make use of composite decking, feel free to browse through this ultimate guide. If you come across shops offering decking options, you will notice the different brands available for composite decking. With these different brands are different colours, patterns, lengths, widths and shades for you to choose from. These different forms are achieved by a process where composite boards are typically installed on a sub-structure made out of pressure-treated lumber which can eventually be used both for the purpose of replacing or installing a new deck. Composite decking is well-loved for a list of attributes. One of them is the fact that it is easy to install on any sub-structure. They can also be drilled and cut easily this lessening the time with which you need to work on them. 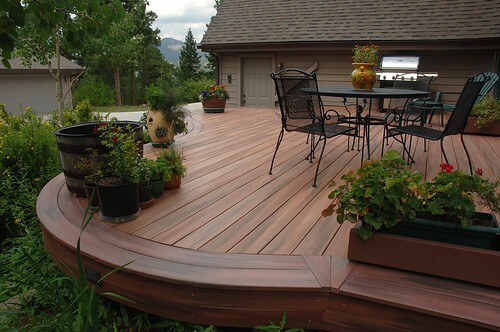 Additionally, composite decking has a very smooth finish making them smooth to the touch. If you are looking for decks with excellent traction, composite decking is definitely a good choice to consider including on your list. In the world of composite decking, you will come across a material that is made from premium resin. This one is made out of purely engineered polymer material that requires less maintenance. These versions of composite decking are not made of the usual wood fibre or organic material used in manufacturing composite decks. They can be recycled 100% and are definitely a good choice for the fact that they are resistant to bacteria, termites, mould and mildew. Composite decks are expensive. In fact, they cost much more than decks made out of purely pressure-treated lumber. Despite that cost though, you can try to equate the fact that they are low maintenance and are definitely highly durable. These factors make them less costly than other decking materials in the long run. The cost, also, is affected by the cost of other important materials needed like fasteners, joist hangers, fasteners and the substructure. One important tip when purchasing a composite deck: Make sure you buy all materials at once to avoid slight differences in colour hues. As mentioned awhile back, one of the advantages of composite decking is its easy installation. This can be attributed to the fact that whilst they weigh the same way as wood does, they are relatively more flexible. This makes them easy to move and lift whenever needed. It will be wise to store them on a flat surface and when you are storing them outdoors, you should cover them before installing the material. Ease of cutting – this is yet another advantage mentioned previously in this page. The ease of cutting is best explained by the fact that you can actually use the same tools for cutting pressure-treated lumber when cutting composite decking materials. In this case, you should have carbide-tipped saw blade. Make sure that you use a mitre saw for cutting EON apart from using carbide saw blades. Take note that it is also important to cut the board quickly if you want to achieve clean cuts on it. When you have these tools and you know these methods then you can achieve ease of cutting on composite decking by all means. Composite decking products come in various sizes that make them similar to wood decking, in a way. Sizes include 2 by 4 inches, 2 by 6 inches and 5/4 by 6 inches. With these different sizes, you should expect that they are sold in different prices as well. Depending on the company manufacturing these composite decks, you can avail of custom sizes too. In order to finish your work with composite decking, it is good to note that they can be sold together with some other items like decorative trims, balusters, handrails and fascias. These products make working on your decks a whole lot easier. Composite decking is indeed one of the great choices you have for your modern structure. If you are thinking twice about investing on these pieces then reread this page. Learn what makes them a great option and when you are convinced that they are indeed a great choice, it will be good to look for composite decking in Edmonton today!